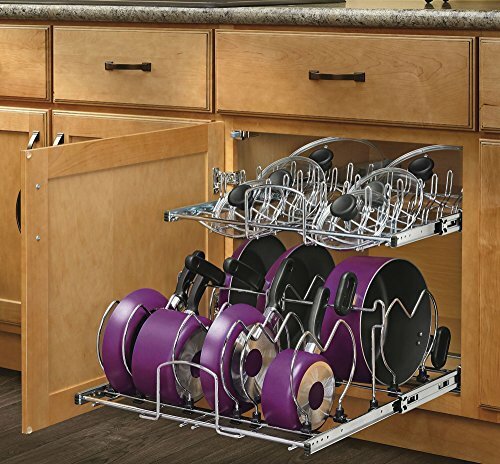 Revolutionize the way you store your pots, pans, and lids with Rev-A-Shelf’s Two-Tier Cookware Organizer. The 5CW2 features independently operating shelves that accommodate a variety of cookware sizes and brands. The top tier organizes lids and the bottom tier features adjustable dividers to store a variety of larger pots and pans. Made with a heavy duty chrome plated wire frame and 100 lb. rated full-extension ball-bearing slides. The bottom, side, and rear mounting provide you the sturdiness you expect and easy installation. Optional Door mounting kit available with the 5WB-DMKIT. So Awesome! This is exactly what I needed. I have a standard 34″ cabinet and all my pots and pans and lids took up the whole thing laying flat and stacked. It took a little while to get this in, mostly because after I first got done I realized that I could raise the top rack to the middle position and had to unscrew it to do so. But my whole Costco set of pots and pans, lids and lids from my casserole dishes fit nice and neat and I even had room to add another sliding bake-ware rack. I bought two for my kitchen of the 12″ size … I bought two for my kitchen of the 12″ size. Our cabinets have the vertical post so while I suppose I could have cut that out and went with the door kits, and then purchase the larger pull out drawers, I just decided to go with 2 of the 12″ size. Not built for the long haul. 3/26/2015 Edit: I have had the newly designed Rev-A-Shelf plastic clips installed in my unit for about six months now. They seem to be holding up well, and I have yet to break one. As such, I am revising my rating to four stars, but leaving my prior commentary intact for anyone who has one of the older models with the bad plastic clips.